Microsoft Office for iPad & Android: Smart Move? According to BGR, Microsoft is poised to release Microsoft Office for the iPad and Android tablets by November of this year. Let's take a look at why this would be a great decision for Microsoft. Now, Microsoft has consistently denied reports of releasing Microsoft Office for non-Windows 8 tablets, but rumors about this have been swirling for months. If this does end up happening, this would most likely be under pressure from Microsoft's Office division that has been looking at entering the high-growth tablet market for a while now. Steve Ballmer & Steven Sinofsky have always wanted to put all their eggs in the Windows 8 basket, but they've probably been pressured into a diversification strategy by Kurt DelBene, president of the Office division. This move insulates the revenues of Microsoft's Office Division, from the Windows 8's prospects. If Windows 8 fails to make a dent in the tablet market market, which seems likely at this point, and with Office not available on other tablets, Microsoft would have missed out on a huge revenue opportunity. By launching Microsoft Office on other tablets, Microsoft could ensure revenues from the growth in the tablet market, irrespective of Windows 8's performance. Onlive Desktop & CloudOn have already released cloud-based MS Office solutions for the iPad and Android tablets. Onlive has a free and premium offering, while CloudOn is a purely free offering, and both services deliver MS Office to tablets, while cutting Microsoft out of any current or future revenues. Microsoft had attempted a legal offensive against these services, but CloudOn was found to comply with licenses and Onlive changed their code to make sure they complied as well. This is a huge risk for the the Office division. While CloudOn and Onlive are still in their early stages of development & usability, it is best to enter the market to put an end to competition in the tablet market, before they gain some traction. Conclusion - Microsoft would be smart to follow through with this move. Even if they believe Windows 8 will be a rousing success, it is best to hedge your bets. They would sell this like hotcakes if brought to Apple and Android especially for Apple. I know my company is definitely starting to use iPads more and more so this would be a no brainer purchase for them. I understand how that may turn people off from Windows 8 tablets but lets be honest Microsoft needs a lot more then Office on their tablet to be successful they need developers more then anything for apps for their tablets and especially their phones. Office on Windows mobile was not very good. I don't expect much different here. 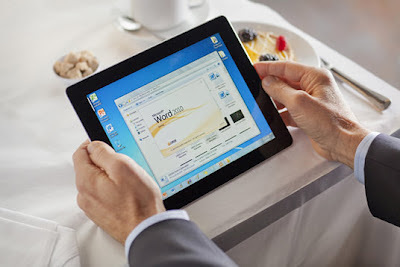 The web version of Office can be used on a connected tablet. I agree this is good for Microsoft. There is a more fundamental reason why Office needs to be very widely available across all popular platforms. The reason is that doing so actually makes Windows Office better, in that it helps remove barriers for customers to collaborate with others using Office. If you want to collaborate with a friend on a document, do you send them an Office doc (or SkyDrive link) or a Google Docs link? For many it's now the latter, and the limited platform availability of Office is a big factor in that. This will become more and more important as Office increases its focus on collaboration and communication. I absolutely agree. But that is the rationale from a consumer's perspective. Microsoft wouldn't make a decision that benefits consumers unless it benefits them first.